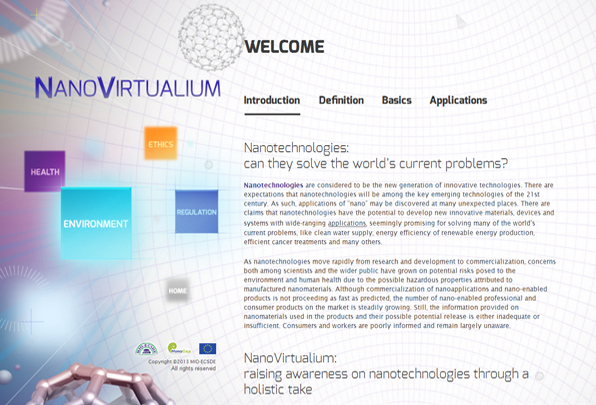 NanoVirtualium is a virtual reality dome inviting you to enter into the developing world of Nanotechnologies. It provides both basic and advanced information on this new emerging technology and it sets out related implications on our health and safety (workers), society at large and the environment. The main aim of NanoVirtualium is to deepen peoples’ understanding on nanotechnologies, their characteristics and potential applications and to offer them the opportunity to take a critical stance on the issue. In this respect, a holistic approach is taken, presenting a wide array of related environmental, health, regulatory and ethical implications. Furthermore, an attempt is made to address nanotechnologies in a balanced manner by presenting both the potential benefits and risks and drawing a line between facts and fiction. It is important for people to understand that while nanotechnologies indisputably offer a wealth of possibilities, it is crucial that nano-research and technological applications are driven by societal needs and priorities towards the resolution of essential problems the world faces, based on ecological, social and sustainability considerations. Nanovirtualium is an initiative of the Mediterranean Information Office for Environment, Culture and Sustainable Development (MIO-ECSDE). The first edition was developed in the framework of the NanoCap project (2006-2009) funded by the European Commission’s FP6 Science and Society Programme. The updated version was realized with funds from the DG Environment programme for operating grants to European environmental NGOs.